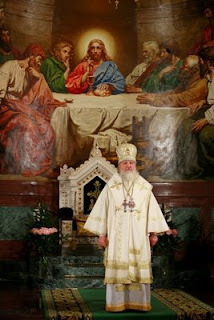 The Russian Orthodox Church will have a new Patriarch at the end of January. The "caretaker" is Metropolitan Kiril (seen here). He is the most ecumenical of the candidates and for that reason is not popular with most of the Bishops who tend to be more nationalistic. In my opinion (shared by many others, I'm sure) it would be better for future ecumenical relations and the hope of Christian Unity if Kiril was elected. However, there may be other factors that we know nothing about. We must pray that God's candidate is elected and that fear and prejudice play little part in the choice. The Russian Orthodox Church is a powerhouse of prayer and devotion. As Pope John Paul 11 wrote, The Body of Christ needs to breathe with "both lungs" and this means that East and West must be reconciled. Let us pray-fervently-that the coming election of the new Patriarch ushers in a new era in Rome/Russia relations.